"STK w/Irrlicht": Blow up, or be blown up! 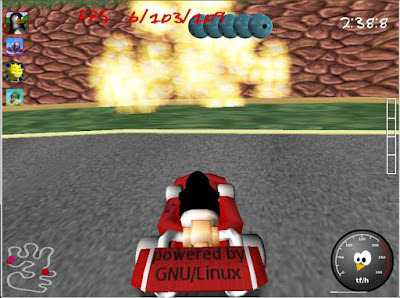 The community is waiting intently for SuperTuxKart version 0.7, but there's still much to do before the team will make a stable release. Fortunately, there will be an alpha release out quite soon (no exact date, but a week or two has been mentioned as an estimate). Do not expect the alpha release to be ready for regular players, as most content and some important features will not be there. The alpha release will be for artists who can help out with converting old karts and tracks to the new format with Blender, and perhaps start creating their own stuff with the new features included. While we wait for the alpha version, it's time for some special effects! Just a quick demonstration of it against the wall. Pretty hefty explosion I'd say, so I'll be more careful next time I go bowling. Furthermore, time trial now works as usual. We also got a final lap message patch from Stephan Hillebrand; thanks. 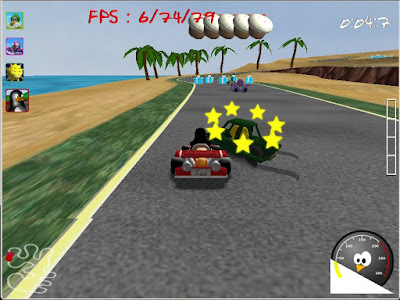 The Irrlicht branch has been moved to trunk, so the current location is https://supertuxkart.svn.sourceforge.net/svnroot/supertuxkart/main/trunk. Please wait for the stable version of STK 0.7 if you do not intend to contribute. The team is not giving general support for the svn version. Nice! Does the kart "Spin Out" while the stars are circling it? Thanks for keeping us to date! My kids love this game and are eagerly looking forward to a new and improved version of supertuxkart.